Providing you the best range of ayushman bharat kit with effective & timely delivery. 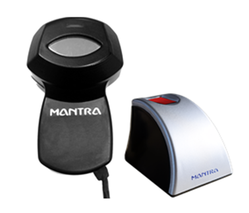 Mantra MIS100 IRIS Scanner can be used extensively for identity applications like Aadhaar Authentication, Banking Applications and Access Control Applications. MIS100 quality algorithm can easily identify poor IRIS images that can be adjusted easily based on inbuilt LED indications. High-Resolution CMOS Sensor generates quality ISO/IEC 19794-6 Images with JPEG2000 compression. MIS100 proprietary distance sensing and focus analysis technology gives fast auto capture capabilities.